This past weekend I was privileged enough to attend a wonderful pop culture convention that shall remain nameless. While participating in the excellent panel discussions, film screenings, and photo ops, I crystalized an idea I’d been flirting with for a while now: How to attack the problem of copyright infringement by vendors at conventions. All it took was a walk through “Artist Alley” to really understand the magnitude of the problem. Without exaggeration or hyperbole, 70-80% of the vendors and artists were selling infringing intellectual property (‘IP’). Artists/vendors are selling items that clearly infringe the copyrights of others. Artists/vendors often do not understand how IP rights work, and more troubling, often don’t understand the risk they’ve taken on by selling potentially infringing items at a convention. Artists often rely on selling such work to make ends meet. Convention organizations, with few exceptions, turn a blind eye to their vendors’ sale of infringing material. IP rights holders aren’t enforcing their rights – or perhaps not even paying attention to the issue. Consumers (that is to say con-goers) either don’t understand that what they’re doing is supporting theft, or they don’t care. So what’s the answer? Is there an answer? Who is the most at risk here, and how can everyone – artists, vendors, attendees, and organizers – protect themselves? In the discussions below, I’ve attempted to provide some suggestions intended to help artists, vendors, and con-goers alike navigate their way through this … ridiculousness. This is a statement of fact. It is indisputable. I regularly hear uneducated arguments, often citing “fair use”, but in 99.9% of the situations I’ve encountered these arguments are utterly inappropriate. One-of-a-kind, original drawings and paintings of someone else’s IP are okay. Since everyone does it, copyright holders must not care. If I only sell it at conventions, and not online or in stores, it is okay. If I’m not making a profit, it is legal to draw someone else’s characters. Each and every one of these is false. Let me repeat that. Each and every one of these is false. Any questions? 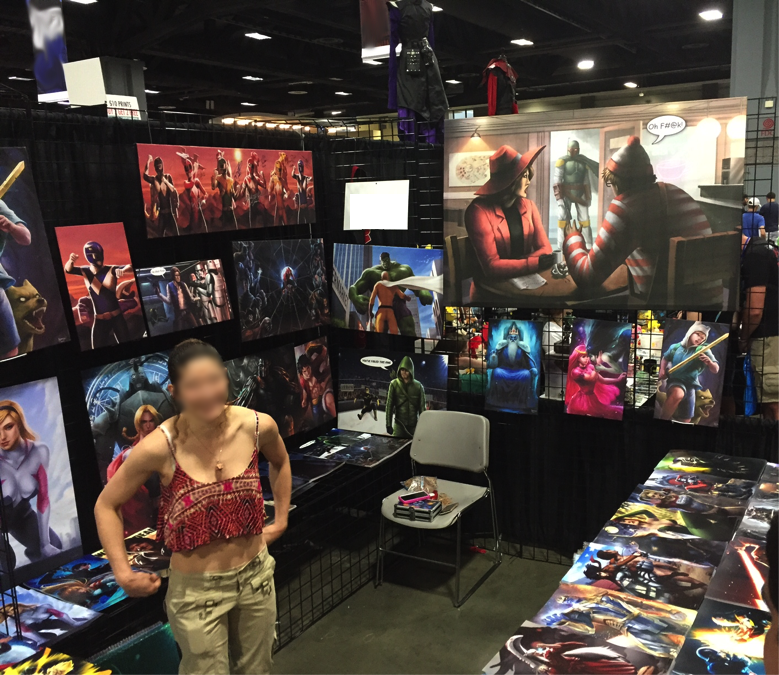 Artists/vendors often do not understand how IP rights work, and more troubling, often don’t understand the risk they’ve taken on by selling potentially infringing products at a convention. Question: Do you own the IP in question? Then you may do as you wish with the IP. You have no right to profit from work featuring the IP, and almost no rights to create infringing work not for profit either. A3: No, but I have a license with the IP rights holder. Then you may do as you wish with the IP, subject to the terms of the license. From a purely legal perspective, these artists are violating the copyright of the IP rights holder. Replication, or the creation of a derivative work, of someone else’s IP is infringement. Copyright is a powerful thing. It was intended to protect authors, but today is mostly used by corporations to protect the rights transferred to them from artists via “work for hire” contracts. We’ll get deeper into the corporate side of things later, but keep that in mind for now. As a result of my personal and professional experience, my discussions with clients, my discussions with artists, and many detailed reviews of illustrator’s contracts, it is clear that the industry is in need of better contracts/agreements that commission a work (or employ an artist). Moreover, given the conspicuous absence of litigation by major corporations, indeed their conspicuous absence in weighing in at all, it stands to reason that they really should have no problem with ceding some small rights back to the artists. Wizards of the Coast/Hasbro has taken a good first step here by allowing Magic the Gathering (‘MTG’) artists to reproduce their work on playmats. Prior to 2016, the vast majority of MTG art was work-for-hire, and the artists retained few or no rights. As you can see, they’ve shifted any risk from themselves onto the vendors and artists. And perhaps rightly so. Is it the job of convention organizers to enforce the law? 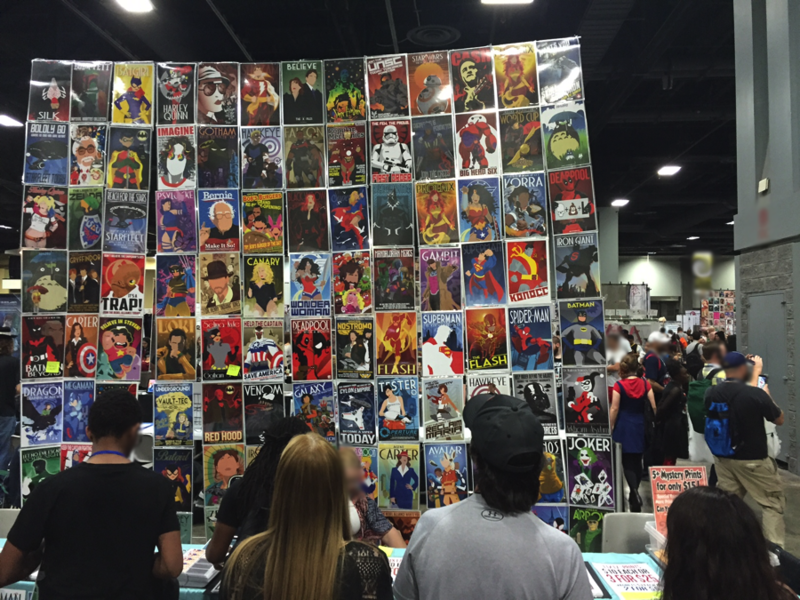 Con organizers have many, many responsibilities – is enforcing IP law one of them? From a legal perspective, it isn’t their responsibility – assuming they’ve shifted the risk to the vendors and artists. Which most of them have done. Now that said, I do believe that Con organizers have a responsibility to require vendors and artists remove infringing products from the vendor room floor – once they’ve been notified that it’s there. By way of illustration, here’s an excerpt from the Otakon artist alley agreement. I had the opportunity to speak with some of the Otakon staff this weekend, and they actually do police the floor for obviously infringing work. While not perfect, their agreement goes go a long way towards protecting IP rights, in that they regularly request artists and vendors remove infringing works. This is troublesome. It leads to the situation we find ourselves in today. In my experience, the combination of artists and vendors who are ignorant of IP law, and the lack of any legal repercussions or penalties, leads to flagrant and widespread IP violations. Take the recent case of Tim Lundmark. 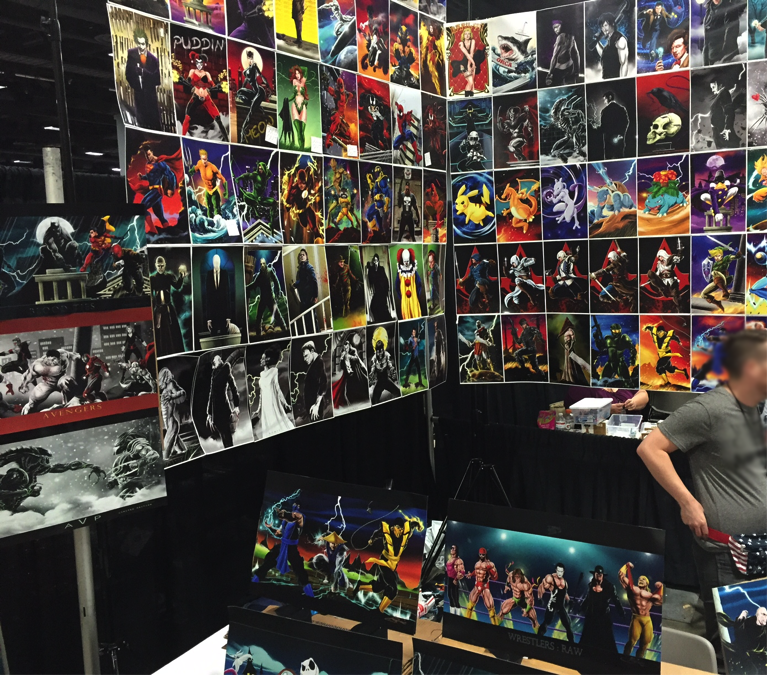 He appeared at Minneapolis Comic Con selling unlicensed prints of many artists’ work. Aldrin Aw / Buzz, who has worked on titles such as X-Factor, Justice League, etc… reported him to the Con organizers, posted extensively on social media, and had the story picked up by Bleeding Cool. I can’t even begin to imagine what it must feel like to have worked on a popular comic, not own the work I did (most in-house artists are employees, and their art is the property of their employer), and show up at a convention to see someone selling blurry, photocopied prints of my own work – that I’m not even permitted to sell?!? Unfortunately, to date no significant action has been taken by any of the larger corporate IP rights holders. Until the large corporations get involved, and make it economically risky to the convention organizers, things are unlikely to change. What it’s going to take is something like the Star Trek Axnar case – which is to say something attached to six-figure dollar signs – before they sit up and take notice. This, to me, is the crux of the issue. 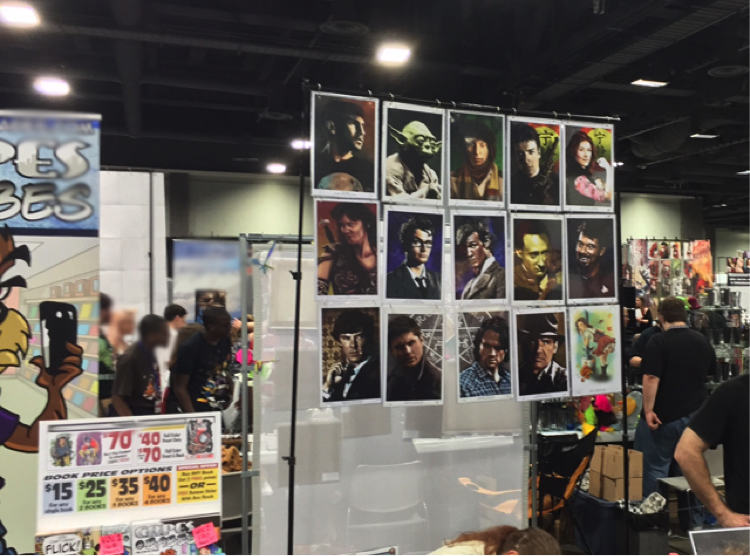 Fans attend conventions because they love the characters, shows, and art. When addressed one-on-one, the vast majority of fans are law-abiding folk who love their favorite comics, characters, and games. I suspect if you asked each individual con-goer, very few, if any, would agree that they’re happy to support what basically amounts to theft. I submit to you that the answer here, as in so many other arenas, is education. Fans, con-goers, artists, vendors, and convention organizers alike need to understand that much of this type of work is unlawful. So how do we educate? San Diego Comic Con brought in John Wells, Deviant Art’s General Counsel, who gave an excellent talk on the subject. More conventions should take a page from this book, and include these excellent discussions in their programming. In all honesty, I expect that nothing’s going to change until someone gets made an example of. Given that Disney is now the parent company of Marvel – the “example” may come sooner rather than later. (In case you’ve been living under a rock, Disney controls its brand and IP with an iron fist.) I urge you … don’t be the horrible, horrible example. If you’ve read this far, I’m assuming you’re still interested and wondering what you can do to help. If you’re a fan it is incredibly easy. All you have to do is ask one of these simple questions of the artist or vendor. As a fan, you bear part of the responsibility to help fix the problem. Don’t buy art or products that rip off the stuff you love. If you’re an artist or convention vendor, you need to educate yourself with regard to intellectual property. After all, as an artist, your job is the creation of intellectual property; and as a convention vendor, your job is selling items that contain someone’s intellectual property. This is the world you live in. It is in your best interest to understand it! Read the contract or agreement that describes what you’ve agreed to by selling/attending each convention. As we’ve seen above, it is likely you’ve agreed that anything you offer for sale will not infringe the IP rights of another, and that you’ll pay for (the legal jargon here is indemnify and defend) any suits or claims against the convention. Do you really want to have to pay a Comic Con to defend a lawsuit brought by Disney, Hasbro or Warner Brothers? Finally, a last word of advice for artists. If you’re at a convention and you see someone selling what appear to be unauthorized copies of a work – say something to the organizers, take a picture, and bring it to social media. But most importantly, keep it civil. If it ever comes to litigation, you want to make sure you look like a rational businessperson. Not a foul-mouthed cretin. It is much more likely (at least in today’s environment) that the issue will play out in the court of public opinion. Things aren’t going to change overnight, but I believe that with a concerted effort on the part of artists, fans, IP rights holders, and convention organizers, we’ll get there eventually. As always, if any of you have more questions, or find yourself in need of legal advice in this arena, my door is always open.